ESA’s Mars Express has imaged an intriguing part of the Red Planet’s surface: a rocky, fragmented, furrowed escarpment lying at the boundary of the northern and southern hemisphere. This region is an impressive example of past activity on the planet and shows signs of where flowing wind, water and ice once moved material from place to place, carving out distinctive patterns and landforms as it did so. Mars is a planet of two halves. In places, the northern hemisphere of the planet sits a full few kilometres lower than the southern; this clear topographic split is known as the martian dichotomy, and is an especially distinctive feature on the Red Planet’s surface. Northern Mars also displays large areas of smooth land, whereas the planet’s southern regions are heavily pockmarked and scattered with craters. 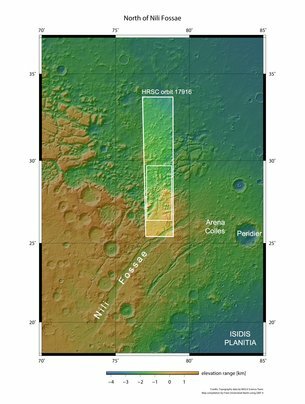 This is thought to be the result of past volcanic activity, which has resurfaced parts of Mars to create smooth plains in the north – and left other regions ancient and untouched. The star of this Mars Express image, a furrowed, rock-filled escarpment known as Nili Fossae, sits at the boundary of this north-south divide. This region is filled with rocky valleys, small hills, and clusters of flat-topped landforms (known as mesas in geological terms), with some chunks of crustal rock appearing to be depressed down into the surface creating a number of ditch-like features known as graben. As with much of the surrounding environment, and despite Mars’ reputation as a dry, arid world today, water is believed to have played a key role in sculpting Nili Fossae via ongoing erosion. In addition to visual cues, signs of past interaction with water have been spotted in the western (upper) part of this image – instruments such as Mars Express’ OMEGA spectrometer have spotted clay minerals here, which are key indicators that water was once present. The elevation of Nili Fossae and surroundings, shown in the topographic view above, is somewhat varied; regions to the left and lower left (south) sit higher than those to the other side of the frame (north), illustrating the aforementioned dichotomy. This higher-altitude terrain appears to consist mostly of rocky plateaus, while lower terrain comprises smaller rocks, mesas, hills, and more, with the two sections roughly separated by erosion channels and valleys. This split is thought to be the result of material moving around on Mars hundreds of millions of years ago. Similar to glaciers on Earth, flows of water and ice cut through the martian terrain and slowly sculpted and eroded it over time, also carrying material along with them. In the case of Nili Fossae, this was carried from higher areas to lower ones, with chunks of resistant rock and hardy material remaining largely intact but shifting downslope to form the mesas and landforms seen today. The shapes and structures scattered throughout this image are thought to have been shaped over time by flows of not only water and ice, but also wind. Examples can be seen in this image in patches of the surface that appear to be notably dark against the ochre background, as if smudged with charcoal or ink. These are areas of darker volcanic sand, which have been transported and deposited by present-day martian winds. Wind moves sand and dust around often on Mars’ surface, creating rippling dune fields across the planet and forming multi-coloured, patchy terrain like Nili Fossae. The data comprising this image were gathered by Mars Express’ High Resolution Stereo Camera (HRSC) on 26 February 2018. ESA’s Mars Express was launched in 2003. As well as producing striking views of the martian surface such as this, the mission has shed light on many of the planet’s biggest mysteries – and helped to build the picture of Mars as a planet that was once warmer, wetter and potentially habitable. 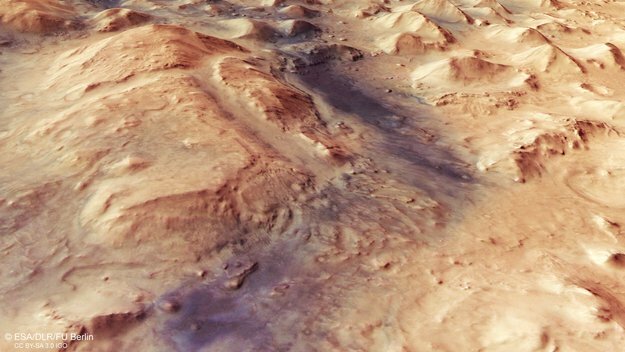 Read more about the past 15 years of Mars Express, and what the mission has discovered so far, here.